Porcelain veneers are an excellent way to get the smile you have always wanted! Veneers can turn worn, misshapen, broken, and discolored teeth into a beautiful, natural smile. In fact, many of the makeovers you may have seen on television utilize porcelain veneers to create life-transforming smiles. 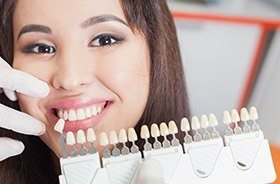 Why Choose Torrington Dental Care for Porcelain Veneers? Porcelain veneers are thin strips of porcelain that Dr. Kuzmin can custom-design to complement your natural tooth shape and color as well as your overall appearance. After some preparation of your teeth, veneers are permanently bonded to the front surface of your teeth, giving you a dramatic and gorgeous smile improvement in just a few visits. If you desire a whiter, straighter, or more complete smile, ask the Torrington Dental Care team today if porcelain veneers are right for you. Torrington Dental Care is in Torrington and offers porcelain veneers to patients from Litchfield County, Burlington, New Hartford, Winsted, Bantam, Goshen, and Harwinton, CT.